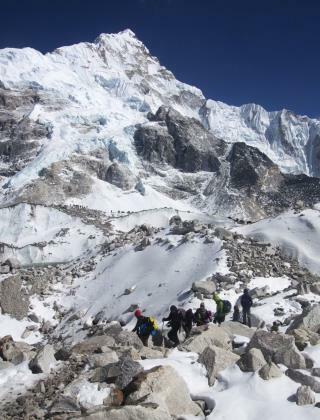 (Newser) – Sunday marked a deadly day on Mount Everest and an especially tragic one for an American who had weathered danger there before. Alabama doctor Roland Yearwood was one of three to die in separate incidents on the mountain, the Washington Post reports. Yearwood, whose cause of death has not been released, previously survived the 2015 avalanche that took 19 lives on Everest following an earthquake. Reuters quotes a trekking company sponsor who says the 50-year-old died at around 27,500 feet; the sponsor was unaware whether Yearwood had already summitted or was still ascending. AL.com reports the married father of two worked at Georgiana Medical Center, and flags a hospital website bio that noted Yearwood was trying to scale the tallest mountain on each of the seven continents. Why do people try crazy things? This ADRENALINE JUNKIE already survived the first one! Why do it again? Did he have a Death Wish? Adrenaline Junkie~Some one who seek out and craves thrilling adventures and/or activities to get an adrenaline rush! A deathwish is a complete disregard of one's own personal safety well-being, or best interests.! Now he's in the HISTORY RECORD BOOKS of those who died while scaling .. A BIG A** MOUNTAIN! There ya go ALL! . As a kid of 8 or 9 I was riding my bike with a neighbor friend. We pulled up to a construction site. It was two stories deep. It had rebar standing straight up and a base of concrete block all around the base of the site. I was standing on the edge when it gave way. I was falling into the site. But the neighbor kid was behind me. He caught me under my arms. He pulled me back from the edge. He kept saying "I knew it was going to happen" Then we got back on our bikes and stopped at a house down the street with a kumquat tree. And then went on about our way. How did we survive "back in the day"?